A replica Statue of Liberty, painted by art students at Lake Region Union High School, stands on the ice of Lake Parker in West Glover on Tuesday. The hill in the background is where locals surmise the statue might've gone, had it been erected in Glover. Lady Liberty might have been Glover’s own Lady of the Lake, had things gone differently back in the 1880s. "Glover, Vermont, was looked at as a place for the Statue of Liberty," explained Tabitha Armstrong, president of the board of directors for Glover Ambulance Squad. She said there’s a hill in West Glover, overlooking Lake Parker, that locals say was considered a possible home for Lady Liberty. The Statue of Liberty replica on Lake Parker on April 9 for the ice out fundraiser. The plan isn't to sink her - rather when a timepiece finally falls through the ice, the person with the closest guess wins half the money. The other half goes to the ambulance squad. "There used to be, I guess, a big tree up on top and it was called Lone Tree Hill," Armstrong said. "And that was the spot that they were looking at for the Statue of Liberty … so we just thought we would incorporate that story in with the ice out." But is that story really true, or just local lore? Glover Historical Society volunteer Joan Alexander said it’s a little of both. "It was reported in the New York Times that Painted Post, New York, and little Glover, Vermont, had both offered to take the Statue of Liberty," said Alexander. "And so, that’s the fact." The proof is in a New York Times editorial, written in 1882, after New York was having trouble raising money for the massive statue’s pedestal. Several places including Glover, Painted Post and Boston campaigned to host the statue. "... We have more than a million people in this City who are resolved that that great lighthouse statue shall be smashed into minute fragments before it shall be stuck up in Boston Harbor. If we are to lose the statue it shall go to some worthier and more modest place - Painted Post, for instance, or Glover, Vt. …"
"The Times has always favored Glover, which has a solid basis for its claims in its gazetteer rating, to wit: it has two churches, a liberal institute, and manufacturers of carriages, furniture and boxes." Although the editorial was tongue-in-cheek, Alexander said it made its point. "Historians do believe that it played a part in embarrassing Boston and New York so that they did beef up their act," she said, "and, of course, New York got it." 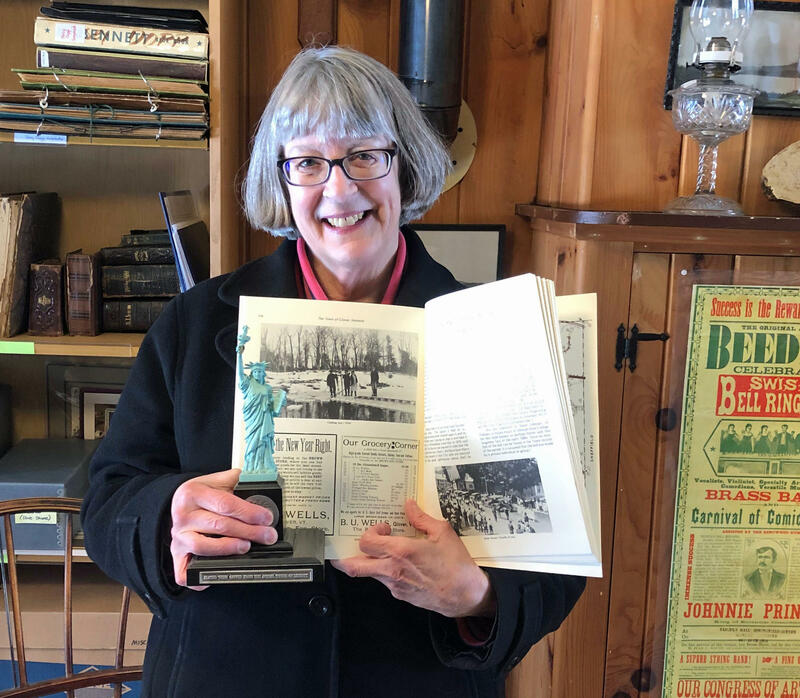 Glover Historical Society volunteer Joan Alexander shows the page in the town history book that references "New York Times" editorials about Glover and the Statue of Liberty. But those newspaper accounts are where the paper trail ends; there’s nothing in the town records, there’s no letter from landowners in the archives. As for the rest of the story, Alexander said that’s local lore. "Where were they planning to put it? That is the conjecture part of the story," said Alexander. "And because Lone Tree, that overlooks Lake Parker in West Glover, is a high point – not the highest point, but it would have been cleared back then – people just surmise that that’s where it was planned to go." It’s not as if this information was passed down through the generations in Glover. According to Alexander, no one in town was aware of this story 35 years ago. It was a local college student writing a history paper on Glover that brought it to the town’s attention in 1983. From left: Tabitha Armstrong, president of Glover Ambulance Squad board of directors, and Chief Adam Heuslein pose with a cardboard cut-out of the Statue of Liberty at Glover Ambulance. "We're not going to sink Lady Liberty intentionally," said Heuslein. "She's stuck in the ice," Armstrong added, "and we’re gonna, you know, rescue her before – hopefully." "Yes," the chief chimed in. "So we do have set up on a different location at the lake a cinder block that’s attached to a clock. So when that falls through, that’s gonna be the ice out." If you want to make a guess as to when that might be, tickets are on sale locally, or you can message them at the Glover Ambulance Facebook page, right up until it happens. A lot of Vermont’s emergency medical services are on life support thanks to declining volunteers and increasing costs. For some, time has run out. Some maple sugarmakers say sap runs through their veins. It may be just an expression, but sugaring does seem to be in the blood of the Osborne brothers. They're still working the family's Ferdinand woods that took the lives of two Osborne patriarchs.